The United States Naval Research Laboratory (NRL) is the corporate research laboratory for the United States Navy and the United States Marine Corps. It conducts basic scientific research, applied research, technological development and prototyping. The laboratory's specialties include plasma physics, space physics, materials science, and tactical electronic warfare. NRL is one of the first US Government scientific R&D laboratories, having opened in 1923 at the instigation of Thomas Edison, and is currently under the Office of Naval Research. NRL's research expenditures are approximately $1 billion per year. 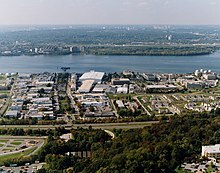 Part of the Naval Research Laboratory main campus in Washington, DC. The prominent satellite dish is often used as a symbol of the laboratory. The Naval Research Laboratory conducts a variety of basic and scientific research and technological development of importance to the Navy. It has a history of scientific breakthroughs and technological achievements dating back to its foundation in 1923. In some instances the laboratory's contributions to military technology have been declassified decades after those technologies have become widely adopted. In 2011, NRL researchers published 1,398 unclassified scientific & technical articles, book chapters and conference proceedings. In 2008, the NRL was ranked No. 3 among all U.S. institutions holding nanotechnology-related patents, behind IBM and the University of California. In 2014, the NRL was researching: armor for munitions in transport, high-powered lasers, remote explosives detection, spintronics, the dynamics of explosive gas mixtures, electromagnetic Railgun technology, detection of hidden nuclear materials, graphene devices, high-power extremely high frequency (35–220 GHz) amplifiers, acoustic lensing, information-rich orbital coastline mapping, arctic weather forecasting, global aerosol analysis & prediction, high-density plasmas, Millisecond pulsars, broadband laser data links, virtual mission operation centers, battery technology, photonic crystals, carbon nanotube electronics, electronic sensors, mechanical nano-resonators, solid-state chemical sensors, organic opto-electronics, neural-electronic interfaces and self-assembling nanostructures. The laboratory includes a range of R&D facilities. 2014 additions included the NRL Nanoscience Institute's 5,000 sq ft (460 m2) Class 100 nanofabrication cleanroom; quiet and ultra-quiet measurement labs; and the Laboratory for Autonomous Systems Research (LASR). This building on NRL's main campus features prominent radomes on its roof. The Naval Research Laboratory has a long history of spacecraft development. This includes the second, fifth and seventh American satellites in Earth orbit, the first solar-powered satellite, the first surveillance satellite, the first meteorological satellite and the first GPS satellite. Project Vanguard, the first American satellite program, tasked NRL with the design, construction and launch of an artificial satellite, which was accomplished in 1958. As of 2013[update], Vanguard I and its upper launch stage are still in orbit, making them the longest-lived man-made satellites. Vanguard II was the first satellite to observe the Earth's cloud cover and therefore the first meteorological satellite. NRL's Galactic Radiation and Background I (GRAB I) was the first U.S. intelligence satellite, mapping out Soviet radar networks from space. The Global Positioning System (GPS) was invented at NRL and tested by NRL's Timation series of satellites. The first operational GPS satellite, Timation IV (NTS-II) was designed and constructed at NRL. NRL pioneered the study of the sun Ultraviolet and X-Ray spectrum and continues to contribute to the field with satellites like Coriolis (satellite) launched in 2003. NRL is also responsible for the Tactical Satellite Program with spacecraft launched in 2006, 2009 and 2011. The NRL designed the first satellite tracking system, Minitrack, which became the prototype for future satellite tracking networks. Prior to the success of surveillance satellites, the iconic parabolic antenna atop NRL's main headquarters in Washington, D.C. was part of Communication Moon Relay, a project that utilized signals bounced off the Moon both for long-distance communications research and surveillance of internal Soviet transmissions during the Cold War. NRL's spacecraft development program continues today with the TacSat-4 experimental tactical reconnaissance and communication satellite. In addition to spacecraft design, NRL designs and operates spaceborne research instruments and experiments, such as the Strontium Iodide Radiation Instrumentation (SIRI) and RAM Angle and Magnetic field sensor (RAMS) aboard STPSat-5 , the Wide-field imager for solar probe (WISP) aboard the Parker Solar Probe, and the Large Angle and Spectrometric Coronagraph Experiment (LASCO) aboard the Solar and Heliospheric Observatory (SOHO). NASA's Fermi Gamma-ray Space Telescope (FGST) [formerly called Gamma-ray Large Area Space Telescope (GLAST)] was tested at NRL spacecraft testing facilities. NRL scientists have most recently contributed leading research to the study of novas and gamma ray bursts. NRL satellite image of hurricane Harvey just prior to landfall on the Texas coast, 2017. The Marine Meteorology Division (Naval Research Lab–Monterey, NRL–MRY), located in Monterey, California, contributes to weather forecasting in the United States and around the world by publishing imagery from 18 weather satellites. Satellite images of severe weather (e.g. hurricanes and cyclones) that are used for advanced warning often originate from NRL–MRY, as seen in 2017 during hurricane Harvey. NRL is also involved in weather forecasting models such as the Hurricane Weather Research and Forecasting model released in 2007. NRL has a long history of contributions to materials science, dating back to the use of Industrial radiography with gamma rays for the nondestructive inspection of metal casings and welds on Navy vessels beginning in the 1920s. Modern mechanical fracture mechanics were pioneered at NRL and were subsequently applied to solve fracture problems in Navy vessels, commercial aircraft and Polaris missiles. That knowledge is in widespread use today in applications ranging from design of nuclear reactors to aircraft, submarines and toxic material storage tanks. NRL developed the synthesis of high-purity GaAs crystals used in a myriad of modern high frequency transceivers including cellular phones, satellite communication systems, commercial and military radar systems including those aboard all US combat aircraft and ARM, Phoenix, AIM-9L and AMRAAM missiles. NRL's GaAs inventions were licensed by Rockwell, Westinghouse, Texas Instruments and Hughes Research. High-purity GaAs is also used for high-efficiency solar cells like those aboard NASA's Spirit and Opportunity rovers currently on Mars. Fundamental aspects of stealth technology were developed at NRL, including the radar absorption mechanisms in ferrite-containing materials. Metal bearing surface treatments using Cr ion implantation researched at NRL nearly tripled the service life of Navy turbine engine parts and was adopted for Army helicopter parts as well. Fluorinated polyurethane coatings developed at NRL are used to line fuel storage tanks throughout the US Navy, reducing leakage and environmental and fuel contamination. The same polymer films are used in Los Angeles-class submarine radomes to repel water and enable radar operation soon after surfacing. Scientists at NRL frequently contribute theoretical and experimental research on novel materials, particularly magnetic materials and nanomaterials and thermoplastic. The first modern U.S. radar was invented and developed at NRL in Washington, DC in 1922. By 1939, NRL installed the first operational radar aboard the USS New York, in time for radar to contribute to naval victories of the Coral Sea, Midway and Guadalcanal. NRL then further developed over-the-horizon radar as well as radar data displays. NRL's Radar Division continues important research & development contributing to US Navy and US Department of Defense capabilities. NRL's Tactical Electronic Warfare (TEW) Division is responsible for research and development in support of the Navy's tactical electronic warfare requirements and missions. These include electronic warfare support measures, electronic countermeasures, and supporting counter-countermeasures, as well as studies, analyses, and simulations for determining and improving the performance of Electronic Warfare systems. NRL TEW includes aerial, surface, and ground EW within its scope. NRL is responsible for the identification, friend or foe (IFF) system and a number of other advances. The Information Technology Division has a world-class information security R&D group, which is where the IETF's IP Security (IPsec) protocols were originally developed. The Encapsulating Security Payload (ESP) protocol developed at NRL is widely used for virtual private network (VPN) connections worldwide. The projects developed by the laboratory often become mainstream applications without public awareness of the developer; an example in computer science is onion routing, the core principle of the anonymizing Tor software. Nuclear power research was initiated at NRL as early as 1939, six years before the first atomic bomb, for the purpose of powering submarines. Uranium enrichment methods sponsored by NRL over the course of World War II were adopted by the Manhattan Project and guided the design of Oak Ridge National Laboratory's Uranium enrichment plant. NRL is currently developing laser focusing techniques aimed at inertial confinement fusion technology. The Static discharger seen on trailing edges of virtually all modern aircraft was originally developed by NRL scientists during World War II. After the war, the laboratory developed modern synthetic lubricants initially for use in the Navy's jet aircraft but they were subsequently adopted by the commercial jet industry. In the late 1960s, NRL researched low-temperature physics, achieving for the first time a temperature within one millionth of a degree of absolute zero in 1967. In 1985 two scientists at the laboratory, Herbert A. Hauptman and Jerome Karle, won the Nobel Prize for devising direct methods employing X-ray diffraction analysis in the determination of crystal structures. Their methods form the basis for the computer packages used in pharmaceutical labs and research institutions worldwide for the analysis of more than 10,000 new substances each year. NRL has most recently published research on quantum computing, quantum dots, plasma shockwaves, thermodynamics of liquids, modeling of oil spills and other topics. NRL operates a small squadron of research aircraft termed Scientific Development Squadron ONE VXS-1. Its missions include, for example, Rampant Lion, which used sophisticated airborne instrumentation (gravimeters, magnetometers and hyperspectral cameras) to collect precise 3D topography of two-thirds of Aghanistan and locate natural resources (underground gas and mineral deposits, vegetation types, etc.) there and in Iraq and Colombia. The Division of Plasma Science conducts research and development into ionized matter. NRL currently holds the world record for most energetic rail gun projectile (33 MJ, 9.2 kWh) and fastest man-made projectile (334 million mph, 538 million km/h). The laboratory is divided into four research directorates, one financial directorate, and one executive directorate. All the directorates are headquartered in Washington, D.C. Many directorates have other facilities elsewhere, primarily at either the Stennis Space Center in Bay St Louis, Mississippi or in Monterey, California. Most NRL staff are civilians in the civil service, with a relatively small number of Navy enlisted personnel or officers. In addition, there are some support contractors that work on-site at NRL. As of 31 December 2015, across all NRL locations, NRL had 2540 civilian employees (i.e., not including civilian contractors). On the same date, there were 35 military officers on-board NRL and 58 enlisted on-board NRL, most of whom are with NRL's VXS-1 Scientific Flight Detachment, which is located at the Patuxent River ('Pax River') Naval Air Station (NAS) in southern Maryland. NRL has special authority to use a Pay-Band pay system instead of using the traditional General Schedule (GS) pay system for its civilian employees. This gives NRL more ability to pay employees based on performance and merit, rather than time-in-grade or some other seniority metric. There are several different pay-band groups at NRL, each being for different categories of civilian employees. As of 31 December 2015, NRL had 1615 civilian scientists/engineers in the NP pay system, 103 civilian technicians in the NR pay system, 383 civilian administrative specialists/professionals in the NO pay system, and 238 civilian administrative support staff in the NC pay system. NRL scientists & engineers typically are in the (NP) pay group in NRL's Pay Band system. The NP-II pay band is equivalent to GS-5 Step 1 through GS-10 Step 10. The NP-III pay band is equivalent to GS-11 Step 1 through GS-13 Step 10. NRL's Pay Band IV corresponds to the GS-14 Step 1 to GS-15 Step 10 pay grades, inclusive, while NRL's Pay Band V can pay above GS-15 Step 10 and corresponds to the Senior Technologist (ST) pay grade elsewhere in the civil service. A new graduate scientist or engineer with a Bachelor of Science degree typically is hired with a salary equivalent to a GS-7, while a new graduate scientist or engineer with a Master of Science degree typically at the equivalent of a GS-11. According to the NRL Fact Book (2016), of NRL civilian full-time permanent employees, 870 had a doctorate, 417 had a master's, and 576 had a bachelor's as their highest degree. The laboratory also hosts post-doctoral researchers and was voted #15 in the Best Places to Work PostDocs 2013 survey. The Systems Directorate (Code 5000) is responsible for performing a range of activities from basic research through engineering development to expand the operational capabilities of the US Navy. There are four research divisions: Radar, Information Technology, Optical Sciences, and Tactical Electronic Warfare. The Materials Science and Component Technology Directorate (Code 6000) carries out a range of materials research with the aim of better understanding of the materials in order to develop improved and advanced materials for use by the US Navy. There are seven research divisions: Laboratory for the Structure of Matter, Chemistry, Material Science & Technology, Laboratory for Computational Physics and Fluid Dynamics, Plasma Physics, Electronics Science & Technology, and the Center for Biomolecular Science & Engineering. The Ocean and Atmospheric Science and Technology Directorate (Code 7000) performs research in the fields of acoustics, remote sensing, oceanography, marine geosciences, marine meteorology, and space science. There are six research divisions: Acoustics, Remote Sensing, Oceanography, Marine Geosciences, Marine Meteorology, and Space Science. The Naval Center for Space Technology (Code 8000) is a focal point and integrator for NRL technologies used in space systems. It provides system engineering and technical assistance for development and acquisition of space systems. There are two research departments: Space Systems Development and Spacecraft Engineering. Scientific Development Squadron ONE (VXS-1) NP-3D Orion. The Executive Directorate operations are directed by the Commander of the NRL, who typically is a US Navy Captain. Scientific Development Squadron ONE (VXS-1), located at Naval Air Station Patuxent River, Maryland, which provides airborne research facilities to NRL and other agencies of the US Government, is run out of the Executive Directorate. The Business Operations Directorate provides program management for the business programs which support the scientific directorates of NRL. It provides contracting, financial management and supply expertise to the scientific projects. In April 2001, in a departure from traditional working relationships between NRL scientists, the Institute for Nanoscience was established to conduct multidisciplinary research in the fields of materials, electronics and biology. Scientists may be part of the Nanoscience Institute while still performing research for their respective divisions. An aerial view of the NRL complex in 2012. The area shown contains the oldest five buildings on the campus. The main campus of NRL is in Washington, DC, near the southernmost part of the District. It is on the Potomac River and is immediately south of (but is not part of) Joint Base Anacostia-Bolling. This campus is immediately north of the Blue Plains site of the DC Water Authority. Exit 1 of northbound I-295 leads directly to Overlook Avenue and the NRL Main Gate. The U.S. Postal Service operates a post office on the NRL main campus. NRL-Stennis is located at NASA's Stennis Space Center in Bay St. Louis, Mississippi, and specializes in oceanography, marine geology, geophysics, geoacoustics, and geotechnology. NRL-Monterey is located east of the Naval Postgraduate School in Monterey, California, sharing a campus with the Fleet Numerical Meteorology and Oceanography Center and the San Francisco Bay Area/Monterey local forecast office of the National Weather Service. NRL-Monterey is dedicated to meteorology and atmospheric research. The Scientific Development Squadron ONE (VXS-1) is located at the Patuxent River Naval Air Station in Lexington Park, Maryland, and operates a wide range of research aircraft. The Chesapeake Bay Detachment (CBD) in Chesapeake Beach, Maryland is 168-acre site for research in radar, electronic warfare, optical devices, materials, communications, and fire research. This facility is often used in combination with the Multiple Research Site on Tilghman Island, Maryland just across the Chesapeake Bay. The Midway Research Center in Quantico, Virginia, Free Space Antenna Range in Pomonkey, Maryland, and Blossom Point Satellite Tracking and Command Station in Blossom Point, Maryland are used by NRL's Naval Center for Space Technology. The Marine Corrosion Facility located on Fleming Key at Naval Air Station Key West in Florida is used by the Center for Corrosion Science & Engineering. The ex-USS Shadwell in Mobile Bay, Alabama is used by the Center for Safety and Survivability to develop and test techniques and equipment for shipboard fire fighting. NRL operates several synchrotron radiation beamlines and the Extreme-Ultraviolet and X-Ray Calibration Facility at the National Synchrotron Light Source at the Brookhaven National Laboratory. Artifacts found on the NRL campus, such as stone tools and ceramic shards, show that the site had been inhabited since the Late Archaic Period. Cecil Calvert, 2nd Baron Baltimore granted the tract of land including the present NRL campus to William Middleton in 1663. It became part of the District of Columbia in 1791, and was purchased by Thomas Grafton Addison in 1795, who named the area Bellevue and built a mansion on the highlands to the east. Zachariah Berry purchased the land in 1827, who rented it out for various purposes including a fishery at Blue Plains. The mansion was demolished during the Civil War to build Fort Greble. In 1873 the land was purchased by the federal government as the Bellevue Annex to the Naval Gun Factory, and several buildings were constructed including the Commandant's house, "Quarters A", which is still in use today. The Naval Research Laboratory came into existence from an idea that originated from Thomas Edison. In a May 1915 editorial piece in the New York Times Magazine, Edison wrote; "The Government should maintain a great research laboratory... In this could be developed...all the technique of military and naval progression without any vast expense." This statement addressed concerns about World War I in the United States. Edison then agreed to serve as the head of the Naval Consulting Board that consisted of civilians who had achieved expertise. The focus of the Naval Consulting Board was as advisor to the U.S. Navy pertaining to science and technology. The board brought forward a plan to create a modern facility for the Navy. In 1916 Congress allocated $1.5 million for implementation. However, construction was delayed until 1920 because of the war and internal disagreements within the board. The U.S. 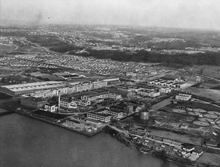 Naval Research Laboratory, the first modern research institution created within the United States Navy, began operations at 1100 on 2 July 1923. The Laboratory's two original divisions – Radio and Sound – performed research in the fields of high-frequency radio and underwater sound propagation. They produced communications equipment, direction-finding devices, sonar sets, and the first practical radar equipment built in the United States. They performed basic research, participating in the discovery and early exploration of the ionosphere. The NRL gradually worked towards its goal of becoming a broadly based research facility. By the beginning of World War II, five new divisions had been added: Physical Optics, Chemistry, Metallurgy, Mechanics and Electricity, and Internal Communications. Total employment at the NRL jumped from 396 in 1941 to 4400 in 1946, expenditures from $1.7 million to $13.7 million, the number of buildings from 23 to 67, and the number of projects from 200 to about 900. During World War II, scientific activities necessarily were concentrated almost entirely on applied research. New electronics equipment – radio, radar, sonar – was developed. Countermeasures were devised. New lubricants were produced, as were antifouling paints, luminous identification tapes, and a sea marker to help save survivors of disasters at sea. A thermal diffusion process was conceived and used to supply some of the U-235 isotope needed for one of the first atomic bombs. Also, many new devices that developed from booming wartime industry were type tested and then certified as reliable for the Fleet. As a result of the scientific accomplishments of the WWII, the United States emerged into the postwar era determined to consolidate its wartime gains in science and technology and to preserve the working relationship between its armed forces and the scientific community. While the Navy was establishing the Office of Naval Research (ONR) as a liaison with and supporter of basic and applied scientific research, the Navy encouraged NRL to broaden its scope since it was the Navy Department's corporate research laboratory. NRL was placed under the administrative oversight of ONR after ONR was created. NRL's Commanding Officer reports to the Navy's Chief of Naval Research (CNR). The Chief of Naval Research leads the Office of Naval Research, which primarily is located in the Ballston area of Arlington, Virginia. The reorganization also caused a parallel shift of the Laboratory's emphasis to one of long-range basic and applied research in the full range of the physical sciences. However, rapid expansion during the war had left NRL improperly structured to address long-term Navy requirements. One major task – neither easily nor rapidly accomplished – was that of reshaping and coordinating research. This was achieved by transforming a group of largely autonomous scientific divisions into a unified institution with a clear mission and a fully coordinated research program. The first attempt at reorganization vested power in an executive committee composed of all the division superintendents. This committee was impracticably large, so in 1949, a civilian director of research was named and given full authority over the program. Positions for associate directors were added in 1954. In 1992, the previously separate Naval Oceanographic and Atmospheric Research Laboratory (NOARL), with centers in Bay St. Louis, Mississippi, and Monterey, California, was merged into NRL. Since then, NRL is also the lead Navy center for research in Oceanographic and Atmospheric Sciences, with special strengths in physical oceanography, marine geosciences, ocean acoustics, marine meteorology, and remote oceanic and atmospheric sensing. This article incorporates public domain material from the United States Government document "http://www.nrl.navy.mil". ^ "Mission". U.S. Naval Research Laboratory. Retrieved 9 December 2013. ^ a b c d e "2016 NRL FactBook" (PDF). U.S. Naval Research Laboratory. August 2016. Retrieved 30 December 2017. ^ a b c d e Saul Oresky; Don DeYoung, eds. (2000). "The Little Book of Big Achievements" (PDF). Naval Research Laboratory. Retrieved 31 January 2014. ^ a b c d e f "NRL Fact Book 2014" (PDF). Naval Research Laboratory. May 2014. Retrieved 8 February 2015. ^ Hsinchun Chen; Mihail C. Roco; Xin Li; Yiling Lin (1 March 2008). "Trends in nanotechnology patents". Nature Nanotechnology. 3 (3): 123–125. Bibcode:2008NatNa...3..123C. doi:10.1038/nnano.2008.51. PMID 18654475. ^ "Nanoscience Programs". Nanoscience Institute. Naval Research Laboratory. Archived from the original on 2012-08-18. Retrieved 31 January 2014. ^ "About the Nanoscience Institute". Nanoscience Institute. Naval Research Laboratory. Archived from the original on 2012-08-19. Retrieved 31 January 2014. ^ Claire Peachey; Kathy Parrish, eds. (October 2008). "Major Facilities 2008" (PDF). Naval Research Laboratory. ^ Brian Heater (1 March 2012). "LASR: behind the curtain of the Navy's robotics laboratory". Engadget. Retrieved 4 March 2016. ^ Robert R. Whitlock; Thomas B. McCaskill (3 June 2009). "NRL GPS Bibliography" (PDF). Naval Research Laboratory. ^ "U.S. Air Force STPSat-5 Satellite Fully Integrated Onboard SpaceX Falcon 9 Launch Vehicle". DEFPOST. Retrieved 12 December 2018. ^ "LASCO". U.S. Naval Research Laboratory. Retrieved 30 December 2017. ^ Naeye, Robert; Gutro, Rob (30 November 2007). "NASA's GLAST Satellite Arrives at Naval Research Lab for Testing". Goddard Space Flight Center: NASA. Retrieved 4 March 2016. ^ Chomiuk, Laura; Linford, Justin D.; Yang, Jun; O'Brien, T.J.; Paragi, Zsolt; Mioduszewski, Amy J.; Beswick, R.J.; Cheung, C.C. ; Mukai, Koji; Nelson, Thomas; Ribeiro, Valério A.R.M. ; Rupen, Michael P.; et al. (8 October 2014). "Binary orbits as the driver of γ-ray emission and mass ejection in classical novae". Nature. 514 (7522): 339–342. arXiv:1410.3473. Bibcode:2014Natur.514..339C. doi:10.1038/nature13773. PMID 25296250. ^ Schaefer, G.H. ; ten Brummelaar, T.; Gies, D.R. ; Farrington, C.D. ; Kloppenborg, B.; Chesneau, O.; Monnier, J.D. ; Ridgway, S.T. ; Scott, N.; Tallon-Bosc, I.; McAlister, H.A. ; Boyajian, T.; et al. (26 October 2014). "The expanding fireball of Nova Delphini 2013". Nature. 515 (7526): 234–236. arXiv:1505.04852. Bibcode:2014Natur.515..234S. doi:10.1038/nature13834. PMID 25363778. ^ The Fermi-LAT Collaboration (1 August 2014). "Fermi establishes classical novae as a distinct class of gamma-ray sources". Science. 345 (6196): 554–558. arXiv:1408.0735. Bibcode:2014Sci...345..554A. doi:10.1126/science.1253947. PMID 25082700. ^ Preece, R.; Burgess, J.M. ; von Kienlin, A.; Bhat, P.N. ; Briggs, M.S. ; Byrne, D.; Chaplin, V.; Cleveland, W.; Collazzi, A.C.; Connaughton, V.; Diekmann, A.; Fitzpatrick, G.; et al. (21 November 2013). "The First Pulse of the Extremely Bright GRB 130427A: A Test Lab for Synchrotron Shocks". Science. 343 (6166): 51–54. arXiv:1311.5581. Bibcode:2014Sci...343...51P. doi:10.1126/science.1242302. PMID 24263132. ^ Ackermann, M.; Ajello, M.; Asano, K.; Atwood, W.B. ; Axelsson, M.; Baldini, L.; Ballet, J.; Barbiellini, G.; Baring, M.G. ; Bastieri, D.; Bechtol, K.; Bellazzini, R.; et al. (21 November 2013). "Fermi-LAT Observations of the Gamma-Ray Burst GRB 130427A". Science. 343 (6166): 42–47. arXiv:1311.5623. Bibcode:2014Sci...343...42A. doi:10.1126/science.1242353. PMID 24263133. ^ The Fermi-LAT Collaboration (17 April 2014). "Inferred Cosmic-Ray Spectrum from Fermi Large Area Telescope gama-Ray Observations of Earth's Limb". Physical Review Letters. 112 (15): 151103. arXiv:1403.5372. Bibcode:2014PhRvL.112o1103A. doi:10.1103/PhysRevLett.112.151103. PMID 24785023. ^ "NRL Monterey Product Demonstrations". U.S. Naval Research Laboratory — Marine Meteorology Division. Retrieved 4 March 2016. ^ a b c d Don J. DeYoung (June 1998). Maureen Long; Saul Oresky, eds. "Celebrating 75 Years of Science and Technology Development for the Navy and the Nation" (PDF). Naval Research Laboratory. ^ "Photovoltaics for Mars". Research & Engineering — NASA Glenn Research Center. 8 September 2008. Archived from the original on 2009-07-31. Retrieved 30 December 2017. ^ Feldman, J.L. ; Singh, D.J. ; Bernstein, N. (26 June 2014). "Lattice-dynamical model for the filled skutterudite: Harmonic and anharmonic couplings". Physical Review B. 89 (22): 224304. Bibcode:2014PhRvB..89v4304F. doi:10.1103/PhysRevB.89.224304. ^ Manni, S.; Choi, Sungkyun; Mazin, I.I. ; Coldea, R.; Altmeyer, Michaela; Jeschke, Harald O.; Valentí, Roser; Gegenwart, P. (11 June 2014). "Effect of isoelectronic doping on the honeycomb-lattice iridate". Physical Review B. 89 (24): 245113. arXiv:1312.0815. Bibcode:2014PhRvB..89x5113M. doi:10.1103/PhysRevB.89.245113. ^ Liu, Xiao; Queen, Daniel R.; Metcalf, Thomas H.; Karel, Julie E.; Hellman, Frances (8 July 2014). "Hydrogen-Free Amorphous Silicon with No Tunneling States". Physical Review Letters. 113 (2): 025503. Bibcode:2014PhRvL.113b5503L. doi:10.1103/PhysRevLett.113.025503. PMID 25062205. 2". Physical Review B. 90 (14): 144421. arXiv:1408.4719. Bibcode:2014PhRvB..90n4421G. doi:10.1103/PhysRevB.90.144421. ^ Glasbrenner, J.K.; Pujari, B.S. ; Belashchenko, K.D. (7 May 2014). "Deviations from Matthiessen's rule and resistivity saturation effects in Gd and Fe from first principles". Physical Review B. 89 (17): 174408. arXiv:1312.7802. Bibcode:2014PhRvB..89q4408G. doi:10.1103/PhysRevB.89.174408. ^ Glasbrenner, J.K.; Žutić, I.; Mazin, I.I. (13 October 2014). "Theory of Mn-doped II-II-V semiconductors". Physical Review B. 90 (14): 140403. arXiv:1405.2854. Bibcode:2014PhRvB..90n0403G. doi:10.1103/PhysRevB.90.140403. ^ Guo, Y.F. ; Princep, A. J.; Zhang, X.; Manuel, P.; Khalyavin, D.; Mazin, I.I. ; Shi, Y.G. ; Boothroyd, A.T. (11 August 2014). "Coupling of magnetic order to planar Bi electrons in the anisotropic Dirac metals". Physical Review B. 90 (7): 075120. arXiv:1311.0308. Bibcode:2014PhRvB..90g5120G. doi:10.1103/PhysRevB.90.075120. ^ Watson, M.D. ; McCollam, A.; Blake, S.F. ; Vignolles, D.; Drigo, L.; Mazin, I.I. ; Guterding, D.; Jeschke, H.O. ; Valentí, R.; Ni, N.; Cava, R.; Coldea, A.I. (30 May 2014). "Field-induced magnetic transitions incompounds". Physical Review B. 89 (20): 205136. arXiv:1310.3728. Bibcode:2014PhRvB..89t5136W. doi:10.1103/PhysRevB.89.205136. ^ Rosa, P.F.S. ; Zeng, B.; Adriano, C.; Garitezi, T.M. ; Grant, T.; Fisk, Z.; Balicas, L.; Johannes, M.D. ; Urbano, R.R. ; Pagliuso, P.G. (24 November 2014). "Quantum oscillations in single crystals". Physical Review B. 90 (19): 195146. arXiv:1402.2412. Bibcode:2014PhRvB..90s5146R. doi:10.1103/PhysRevB.90.195146. ^ Lindsay, L.; Li, Wu; Carrete, Jesús; Mingo, Natalio; Broido, D.A. ; Reinecke, T.L. (24 April 2014). "Phonon thermal transport in strained and unstrained graphene from first principles". Physical Review B. 89 (15): 155426. Bibcode:2014PhRvB..89o5426L. doi:10.1103/PhysRevB.89.155426. ^ Neek-Amal, M.; Xu, P.; Qi, D.; Thibado, P.M.; Nyakiti, L.O. ; Wheeler, V.D. ; Myers-Ward, R.L. ; Eddy, C.R. ; Gaskill, D.K. ; Peeters, F.M. (1 August 2014). "Membrane amplitude and triaxial stress in twisted bilayer graphene deciphered using first-principles directed elasticity theory and scanning tunneling microscopy". Physical Review B. 90 (6): 064101. arXiv:1407.1189. Bibcode:2014PhRvB..90f4101N. doi:10.1103/PhysRevB.90.064101. ^ Gunlycke, Daniel; White, Carter T. (31 July 2014). "Specular graphene transport barrier". Physical Review B. 90 (3): 035452. Bibcode:2014PhRvB..90c5452G. doi:10.1103/PhysRevB.90.035452. ^ Ott, Florian D.; Spiegel, Leo L.; Norris, David J.; Erwin, Steven C. (7 October 2014). "Microscopic Theory of Cation Exchange in CdSe Nanocrystals". Physical Review Letters. 113 (15): 156803. arXiv:1409.4832. Bibcode:2014PhRvL.113o6803O. doi:10.1103/PhysRevLett.113.156803. PMID 25375732. ^ Eshel, Tamir (14 March 2017). "Warfighters Will Be Able to Press and Repair their Armor". Defense Update. ^ "Radar Home". U.S Naval Research Laboratory — Radar Division. ^ "TEWD Home". U.S Naval Research Laboratory — Tactical Electronic Warfare Division. ^ "ITD Home". U.S Naval Research Laboratory — Information Technology Division. ^ Ahern, Joseph-James (April 2002). "The United States Navy's Early Atomic Energy Research, 1939–1946" (PDF). International Journal of Naval History. 1 (1). ^ "NRL Nike Laser Focuses on Nuclear Fusion". U.S. Naval Research Laboratory (Press release). 20 March 2013. Retrieved 4 March 2016. ^ Bried, E.; Kidder, H. F.; Murphy, C. M.; Zisman, W. A. (April 1947). "Synthetic Lubricant Fluids from Branched-Chain Diesters Physical and Chemical Properties of Pure Diesters". Industrial & Engineering Chemistry. 39 (4): 484–491. doi:10.1021/ie50448a014. ^ Murphy, C. M.; O'Rear, J. G.; Zisman, W. A. (January 1953). "Pinic Acid Diesters – Effect of Amide-Type Compounds". Industrial & Engineering Chemistry. 45 (1): 119–125. doi:10.1021/ie50517a040. ^ "The Nobel Prize in Chemistry 1985". Nobelprize.org. Retrieved 4 March 2016. ^ "NRL Scientists Receive 1985 Nobel Prize in Chemistry". U.S. Naval Research Laboratory. Retrieved 4 March 2016. ^ Webster, L.A.; Truex, K.; Duan, L.-M.; Steel, D.G. ; Bracker, A.S.; Gammon, D.; Sham, L.J. (24 March 2014). "Coherent Control to Prepare an InAs Quantum Dot for Spin-Photon Entanglement". Physical Review Letters. 112 (12): 126801. Bibcode:2014PhRvL.112l6801W. doi:10.1103/PhysRevLett.112.126801. PMID 24724666. ^ Solenov, Dmitry; Economou, Sophia E.; Reinecke, Thomas L. (3 April 2014). "Excitation spectrum as a resource for efficient two-qubit entangling gates". Physical Review B. 89 (15): 155404. arXiv:1312.6866. Bibcode:2014PhRvB..89o5404S. doi:10.1103/PhysRevB.89.155404. ^ Davanço, Marcelo; Hellberg, C. Stephen; Ates, Serkan; Badolato, Antonio; Srinivasan, Kartik (16 April 2014). "Multiple time scale blinking in InAs quantum dot single-photon sources". Physical Review B. 89 (16): 161303. arXiv:1306.0614. Bibcode:2014PhRvB..89p1303D. doi:10.1103/PhysRevB.89.161303. ^ Hickstein, Daniel D.; Dollar, Franklin; Gaffney, Jim A.; Foord, Mark E.; Petrov, George M.; Palm, Brett B.; Keister, K. Ellen; Ellis, Jennifer L.; Ding, Chengyuan; Libby, Stephen B.; Jimenez, Jose L.; Kapteyn, Henry C.; et al. (18 March 2014). "Observation and Control of Shock Waves in Individual Nanoplasmas". Physical Review Letters. 112 (11): 115004. arXiv:1401.0187. Bibcode:2014PhRvL.112k5004H. doi:10.1103/PhysRevLett.112.115004. PMID 24702383. ^ Casalini, R.; Roland, C.M. (18 August 2014). "Determination of the Thermodynamic Scaling Exponent for Relaxation in Liquids from Static Ambient-Pressure Quantities". Physical Review Letters. 113 (8): 085701. arXiv:1403.4551. Bibcode:2014PhRvL.113h5701C. doi:10.1103/PhysRevLett.113.085701. PMID 25192107. ^ Poje, A.C.; Ozgokmen, T.M. ; Lipphardt, B.L. ; Haus, B.K. ; Ryan, E.H.; Haza, A.C.; Jacobs, G.A. ; Reniers, A.J.H.M. ; Olascoaga, M.J.; Novelli, G.; Griffa, A.; Beron-Vera, F.J.; et al. (18 August 2014). "Submesoscale dispersion in the vicinity of the Deepwater Horizon spill". Proceedings of the National Academy of Sciences. 111 (35): 12693–12698. arXiv:1407.3308. Bibcode:2014PNAS..11112693P. doi:10.1073/pnas.1402452111. PMC 4156713. PMID 25136097. ^ Naval Research Laboratory (18 June 2010). "Afghanistan's rich mineral deposits: Aerogeophysical survey provides promising prospects of economic development". ScienceDaily. ^ "In Afghanistan, High-Tech Tools Replace The Hammer". NPR. 18 June 2010. ^ Spencer Ackerman (10 December 2010). "Video: Navy's Mach 8 Railgun Obliterates Record". WIRED. ^ "Nike krypton laser achieves spot in Guinness World Records". Phys.org. Naval Research Laboratory. 24 July 2014. ^ a b "Department of Defense Science and Technology Reinvention Laboratory (STRL) Personnel Management Demonstration Project Program". Federal Register. Defense Department. 28 July 2014. ^ "Personnel Demonstration Project". NRL — Human Resources Office. Archived from the original on 2004-04-06. ^ a b c "Facilities". U.S. Naval Research Laboratory. Retrieved 31 December 2017. ^ "Ocean & Atmospheric Science Directorate - Code 7000". U.S. Naval Research Laboratory. Retrieved 20 July 2008. ^ "Nanoscience Institute". U.S. Naval Research Laboratory. Retrieved 31 December 2017. ^ "NAVAL RESEARCH LABORATORY." U.S. Postal Service. Retrieved on September 11, 2018. "4555 OVERLOOK AVE SW WASHINGTON, DC 20375-0001"
^ "Field Sites". U.S. Naval Research Laboratory. Retrieved 10 December 2013. ^ "Directions and Maps". U.S. Naval Research Laboratory — Marine Meteorology Division. Retrieved 4 March 2016. ^ "Monterey". U.S. Naval Research Laboratory. Retrieved 30 December 2017. ^ "Scientific Development Squadron ONE (VXS-1)". U.S. Naval Research Laboratory. Retrieved 4 March 2016. ^ "Facilities". U.S. Naval Research Laboratory — Space Systems Development Department. Retrieved 30 December 2017. ^ "Prehistoric Artifacts Open Window to the Past at NRL". U.S. Naval Research Laboratory (Press release). 28 July 2014. Retrieved 1 August 2014. ^ "Big Laboratory for Navy Planned" (PDF). NY Times. 8 October 1915. Retrieved 5 July 2008. ^ a b c d e Timothy D. Calderwood (October 1998). "Highlights of NRL's First 75 Years" (PDF). Naval Research Laboratory. "The Little Book of Big Achievements" (PDF). NRL. "Pushing the Horizon: 75 years of High Stakes Science and Technology at the Naval Research Laboratory" (PDF). NRL. Current military installations in Washington, D.C.
Coast Guard Station Washington, D.C.
Military facilities in Washington, D.C. This page was last edited on 16 February 2019, at 14:56 (UTC).